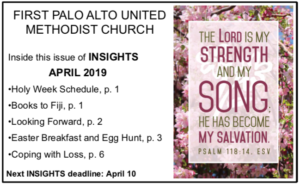 Insights is the monthly email newsletter of the First United Methodist Church of Palo Alto. Clicking on the graphic below will take you to the current issue of Insights. You can subscribe to receive Insights by email by clicking here and signing up.